In our flood-plagued future, what kind of housing will the super-rich buy? In Dubai, we're getting a sneak peek at what super-luxury real estate looks like in a world with unpredictable waters—and the main selling point is that it floats. 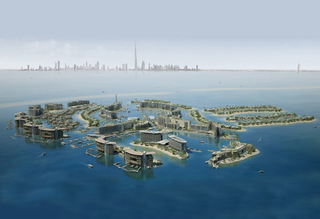 You've probably heard of The World before—the four-mile-wide artificial archipelago created off the coast of Dubai by dumping sand into the gulf and building super-luxury housing on top. The project has been plagued by problems over the last few years. According to the company that signed on to run transportation to and from the islands to Dubai, the current of the Gulf is actually pulling sand away from the fake islands, and the project is "gradually falling back into the sea." The developer of the World has vehemently denied that it's sinking. And maybe it doesn't matter if it is. After all, you could just bypass the issue completely and start building super-luxury housing in the water. A property developer from Dubai called Kleindienst Group, which is developing the European islands under the name "Heart of Europe," announced it would do today. According to a release about the project, the group will be building "underwater villas" with two levels above the water and one level entirely submerged in the sea. The houses will cost about $1.3 million each, and are supposed to be finished by 2017. And they aren't the only ones. Construction Week points out that the developer of the Australia/Southeast Asia part of the World is planning a floating development, too, and has "signed a deal with floating island expert Dutch Docklands to create a series of private island villas." Dutch Docklands is a Netherlands-based company that utilizes engineering techniques developed in the flood-prone Dutch lowlands, and applies them to developments all over the world. We're talking about one of the most flashy real estate markets in the world here, so we need to take these plans with a gigantic grain of salt—there's clearly a lot of bluster here, and these project might just be even more false starts in the ongoing attempts to save the World from is long-floundering self. That said, a plan to build luxury condos for the super-wealthy that float sounds oddly prescient. The real kicker? That both projects are designed to mimic parts of the world—Europe and Southeast Asia that are actually under serious threat of climate-changed induced flooding. The developers even plan to recreate the culture of Europe, too: "Each island within The Heart of Europe takes inspiration from some of Europe's most captivating locations," Kleindienst told the UAE-based National. On the project website, the group says that the islands will "only accept Euros." That's a fun little sales technique for the super wealthy, sure, but it's also strange to imagine a nearly perfect floating simulacrum of European capitals, floating in the ocean, safe from the rising tides that are threatening Venice and some Asian cities. Dubai might be giving us an early glimpse of the future of luxury development in a world where the security of your house is linked to its ability to withstand a deluge.